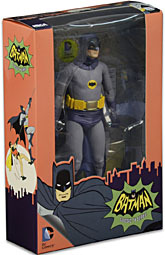 It was big news when, in 2012, Warner Brothers announced they'd worked out a deal with Fox that meant the 1966 Batman TV show would at last be available for merchandising. And while Mattel's toyline started out strong, it quickly seemed to dead-end. Like the Movie Masters toys, they were "good enough," but not great. 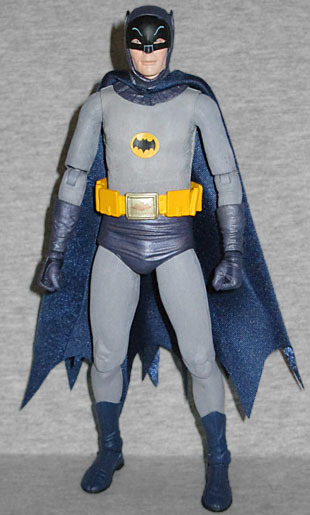 NECA also made a 1966 Batman figure, but due to the restrictions of their license, it had to be quarter-scale - and try as you might, it's hard to mix an 18" figure with ones that are ⅓ its size. But like last year's Michael Keaton, outside forces have conspired to find a way to turn that giant toy into something more budget-friendly and (space-conscious): WB released the toy directly, so NECA was just in charge of production, not distribution. Let's have a round of applause for complicated legal corporate maneuvering! 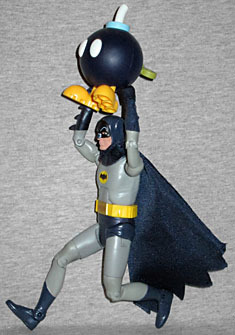 Actually, we should state right up front that this is not just a scaled-down version of the 18" Batman. Compare this toy to its big brother, and you'll begin to see a lot of differences - most obviously, the articulation. This figure moves at the neck, shoulders, elbows, gloves, wrists, chest, waist, hips, thighs, knees and ankles - the big one had swivel biceps and double-hinged elbows, rather than a single swivel/hinge, and the balljoint was in the mid-torso, rather hidden behind the belt. Plus there were hinges in the toes! This required a complete reworking of the sculpt, not just a straight reduction. The changes also mean that, unlike Joker, the articulation on NECA's figure isn't a significant improvement over Mattel's. Fortunately, the sculpt is. 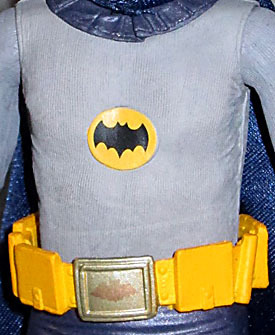 Matty's Batman was smooth and undetailed, with only a minor bit of wrinkling on the boots, gloves and trunks - NECA's has a striated texture on the gray areas (which, for the record, was not on the 18" version) and the bat-symbol in the center of his chest appears to be a separate patch attached to the costume. The lower edge of the cowl is sculpted as part of the torso, itself a rubber sheath over the plastic body beneath, and though the utility belt looks like it's on upside down, that's the way it was really designed: the clasps were at the bottom of the pockets, not the tops. The likeness is amazing. Trevor Zammit handled the sculpt, and it looks stunningly like Adam West. As they did with Michael Keaton (and Armie Hammer, but that's less relevent), NECA didn't just fake a mask, they sculpted a nearly complete face and covered it with a real one. It's stiff plastic, not flexible PVC, but the added depth also means added realism. The cowl looks slightly baggy, but still has fine seams and stitching. 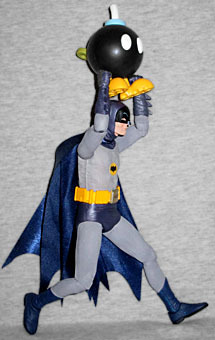 Batman does not come with all the same accessories as the big version - not even the Batusi hands! Aw man, what a bummer! 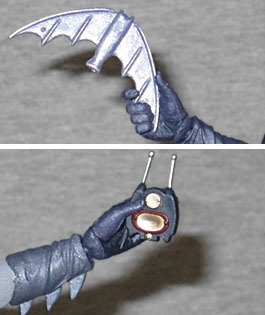 You can replace his fists with a relaxed hand and a clutching hand (one of each, not full sets), and use those to hold the included batarang or bat-radio. Both of those had to be redone too, because the batarang no longer folds in the center, and the "screen" on the radio is convex, rather than flat. All three of the "miracle" NECA figures WB released this year come in the same style box. Well, same dimensions: the actual style of the box is specific to the character; Joker came in a package that looked like he'd broken into the factory and defaced it, and Batman comes in a package decorated with cartoony retro graphics. The back has sound effects (BONK! POW! BAM! KAPOW!) and art of the Batmobile. The insert backdrop is an illustration of the Batcave, showing the Batcomputer, Batradar, the Televiewer, and the super high voltage atomic pile. It's a nice inclusion, and much better than Mattel's backdrops. I have three Toys Я Usses within driving range of me. One has already sold out of these figures, and my local has yet to get them in at all. The only reason I was able to get them at #3 was because the boxes were partially crushed. These are not easy to get! Still, it beats buying a crummy DVD bundle on eBay to get them. I wasn't sure I wanted this figure - yes, he looks a lot better than Mattel's, but he's also in an inch larger scale and doesn't have any sidekicks or villains to go with him. But come on, how much fun is it to have goofy Adam West face off against psychotic Heath Ledger? Theoretically you could do that with Mattel's toys, but NECA's are better.